The Kurzweil Forte is a high end 88 key Stage Piano which features 16GB of hand-selected new sounds and patented FlashPlay™ technology offering ultra-fast performance. The powerful FX engine has award winning reverbs delays choruses flangers phasers distortions rotary amplifiers compressors and more. 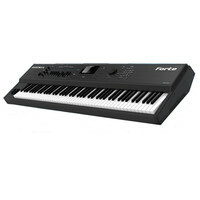 Also featuring an 88-note fully-weighted Italian hammer-action keyboard with aftertouch. This entry was posted in Kurzweil and tagged Keyboards-and-Pianos. Bookmark the permalink.